If applicable, please provide your engraving details below. Feel free to reach out with any questions. Say "Cheers!" 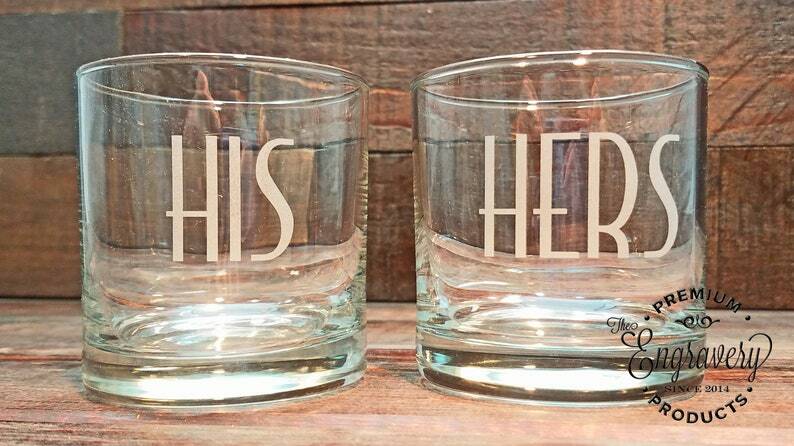 to the happy couple in your life with these custom His and Hers Whiskey Glasses. Included with this purchase are two whiskey glasses, one with 'His' engraved onto it and the other with 'Hers.' 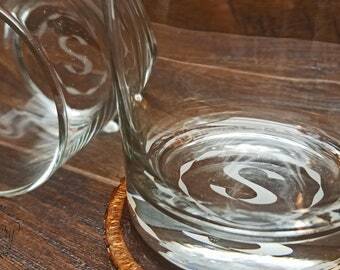 Pair these glasses with a fine bottle of whiskey for a fantastic shower, engagement, wedding, or anniversary gift! These Old Fashioned whiskey glasses have a simple, straight-sided shape and an extra-thick, flat bottom which provides stability, minimizing the potential for breakage. Thanks to a chip-resistant rim and Libbey's Safedge® Rim Guarantee, this glass is durable for long-lasting use. - All of our designs are permanent and backed by our lifetime guarantee. - All engravings and glassware are dishwasher safe. 1. Select the font design: The available designs are found by scrolling right on the listing's image above, images 2-7. 2. Choose whether you would like to add additional engraving. 4. Provide your engraving details in the 'note' section during checkout. Each item will come individually wrapped in brown paper and tied with a bow of twine and its own gift tag affixed, displaying the "To" and the "From"